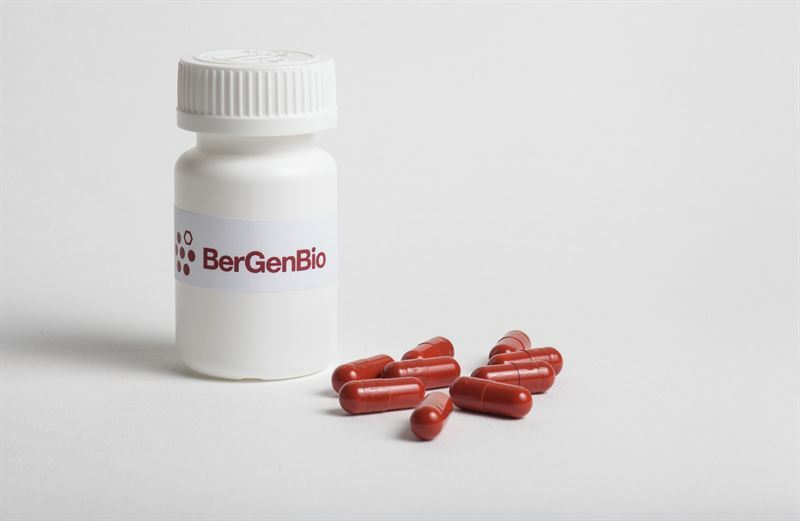 Bergen, Norway, January 29, 2018 – BerGenBio ASA (OSE: BGBIO), a clinical-stage biopharmaceutical company focused on developing bemcentinib as a potential cornerstone therapy for multiple cancer indications, today announced the presentation of data from its broad phase II clinical development programme with its selective AXL inhibitor bemcentinib (BGB324) in two posters at the ASCO-SITC Clinical Immuno-Oncology Symposium (January 25-27, San Francisco, CA, USA). One poster outlined favourable interim safety data from three phase II clinical trials with bemcentinib in combination with KEYTRUDA® (pembrolizumab), an anti-PD-1 therapy marketed by Merck & Co., Inc., Kenilworth, N.J., USA (known as MSD outside the US and Canada). Furthermore, an AXL immunohistochemistry (IHC) method developed and validated by the Company was shown to clearly detect the presence of AXL on tumour and immune cells in patient samples thus holding promise as a potential future companion diagnostic. The second poster provided translational analyses from BerGenBio’s phase II trial in acute myeloid leukaemia (AML), with bemcentinib used as a single agent. The results showed a clear immunomodulatory effect as a result of selective AXL inhibition, as evidenced by increased immune activity characterised by diversification of patients’ T-cell receptor repertoire. The spectrum of observed serious adverse events was similar to that reported for KEYTRUDA alone. 35 patients with relapsed/refractory (R/R) AML or myelodysplastic syndrome (MDS) received bemcentinib monotherapy as part of the BGBC003 trial. Two patients achieved complete responses with incomplete recovery of peripheral counts (CRi) and five achieved partial responses (PR). Eight patients reported disease stabilisation for more than four months. Three patients remain on study at the time of data cut-off (Jan 17th 2018). Six out of nine patients analysed showed a diversification of the T-cell receptor repertoire in their peripheral blood, bone marrow or both indicative of increased immune activity as a result of AXL inhibition. Breast cancer is the most common cancer in women – it is estimated that more than 250,000 new cases will be diagnosed in the US in 2018. 20% of breast cancers lack receptors for three common hormones (oestrogen, progesterone and HER2) and are thus called triple-negative breast cancers (TNBC). Treatment options for TNBC are limited to intense chemotherapy, but disease recurrence is frequent and aggressive. Consequently, novel treatment strategies for TNBC are urgently needed. BGBC007 is a phase II multi-centre open label study of bemcentinib (BGB324) in combination with KEYTRUDA in patients with previously treated, non-resectable TNBC or triple negative inflammatory breast cancer. Up to 56 patients will be included in the study. For more information, please access trial NCT03184558 at www.clinicaltrials.gov. It is estimated that more than 220,000 new cases of lung cancer will be diagnosed in the US in 2018 and it is the leading cause of cancer deaths. 65% of NSCLCs are classed as adenocarcinoma of the lung. Although various treatments exist for NSCLC, they are often curtailed by acquired resistance to therapy. Novel treatments overcoming this resistance in NSCLC are urgently required. BGBC008 is a phase II multi-centre open label study of bemcentinib (BGB324) in combination with KEYTRUDA in patients with previously treated advanced adenocarcinoma of the lung. Up to 48 patients will be included in the study. For more information, please access trial NCT03184571 at www.clinicaltrials.gov. Melanoma is the most serious type of skin cancer and may spread to lymph nodes and distant organs if not discovered in time. Melanoma occurs when the pigment cells in the skin (melanocytes), divide uncontrollably. It is estimated that in 2016, there were almost 150,000 melanoma diagnoses in the US alone. If detected very early, melanoma has a good prognosis; for patients with advanced melanoma, however, the probability of surviving five or more years is less than 20%. BGBIL006 is an investigator initiated, randomised phase II trial combining bemcentinib with either KEYTRUDA or dabrafenib/trametinib in patients with advanced non-resectable or metastatic melanoma who are naïve for systemic treatment. Up to 92 patients will be enrolled across three arms. For more information, please access trial NCT02872259 at www.clinicaltrials.gov. AML is the most common form of acute leukaemia diagnosed in over 20,000 patients in the US annually and is rapidly lethal if left untreated. Successful treatment typically requires intensive therapy or bone marrow transplantation, and relapse and resistance are common. Consequently, there is an urgent need for effective novel therapies in R/R patients, particularly those that are ineligible for intensive therapy. BGBC003 is a phase Ib/II multi-centre open label study of bemcentinib (BGB324) as a single agent in patients with AML or MDS or in a combination with chemotherapy (cytarabine and decitabine) in AML patients. Up to 75 patients will be enrolled at centres in the US, Norway, Germany and Italy. For more information, please access trial NCT02488408 at www.clinicaltrials.gov. BGB324 with KEYTRUDA in triple-negative breast cancer (TNBC). The clinical trials combining BGB324 with KEYTRUDA in adenocarcinoma of the lung and TNBC are conducted in collaboration with Merck & Co., Inc. (Kenilworth, NJ, USA), through a subsidiary. KEYTRUDA® is a registered trademark of Merck Sharp & Dohme Corp., a subsidiary of Merck & Co., Inc. (Kenilworth, NJ, USA). TARCEVA® is a registered trademark of OSI Pharmaceuticals, LLC., marketed by Roche-Genentech. TAFLINAR® is a registered trademark of Novartis International AG and MEKINIST® is a registered trademark of GSK plc.